WASHINGTON (April 28) -- House Speaker Newt Gingrich renewed his attack against Democrats Tuesday setting off a spirited debate on the House floor. 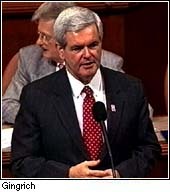 Gingrich accused House Democrats of acting in a partisan manner in the campaign finance hearings. Gingrich announced he is urging Rep. Dan Burton, chairman of the House Government Reform and Oversight Committee, to hold another vote on granting immunity to four prospective witnesses. Last week all committee Democrats voted against granting immunity for the four witnesses. Ranking Democrat Rep. Henry Waxman (D-Calif.) said Democrats had not received sufficient explanation for why immunity was necessary for the witnesses, and accused Burton of conducting a "partisan, reckless effort." Gingrich cited the Senate Watergate and congressional Iran-Contra hearings as examples of bipartisan efforts where immunity was consistently and unanimously granted to witnesses. He also noted the Clinton administration's Justice Department had approved the proposed grants of immunity without any argument. Gingrich's comments came just a day after he strongly criticized Democrats at a Republican political action committee meeting. Gingrich spoke in glowing terms of the bipartisan manner in which Republican Sen. Howard Baker worked with Democratic Sen. Sam Ervin during the Watergate hearings. 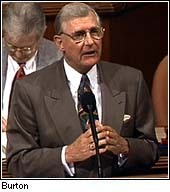 Waxman fired back, saying, "I want to remind the Speaker that the chairman, Sam Ervin, did not accuse the president of the United States of being a scumbag," adding, "I might not be Howard Baker, but Dan Burton is no Sam Ervin." Burton used the vulgarity to describe Clinton in a recent meeting with the editorial board of an Indianapolis newspaper. Burton also took to the floor, saying "the Democrats of the committee have done everything they can to obstruct our investigation ... They try to drag it out and drag it out and drag it out and keep us from getting at the facts." Burton said "the American people have the right to know if their government is for sale, if their foreign policy is for sale, if their defense capability is for sale and if it is, those who are responsible need to be brought to justice." But Waxman said Democrats have not been in a position to hinder the investigation in any way. "They [the Republicans] don't even ask us what to do, they just go ahead and do it," he said. "The only time we have any say in anything is when there's a question of immunity." 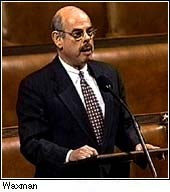 Waxman added, "It's a government-funded Republican campaign to smear Democrats. It is not a legitimate investigation about campaign finance abuses." Waxman said Burton "is just not the person for the job. You don't put somebody in to investigate about campaign finances when he himself is being investigated on the issue of his possible campaign finance abuses." President Bill Clinton refused to be drawn into the controversy. During an afternoon question-and-answer session with reporters, Clinton declined to respond to Gingrich's earlier comments about the stalled House probe or the administration's handling of the Monica Lewinsky investigation. "Mr. Gingrich said a lot of things last night that I don't think deserve a response and I think it would not serve the American public well to waste my time doing it," Clinton said. "I think I need to be focused on the public issues that affect them and that's what I intend to do."